In this HPLC column buying guide, discover the key factors and application considerations when looking to buy new columns. Plus, read impartial reviews to gain insights from industry leading professionals. High-performance liquid chromatography (HPLC) is one of the most powerful analytical tools available today and works by separating individual compounds based on their polarity. HPLC separation is distinct from liquid chromatography (LC), with solvent passing through the column under high pressure, making separations much faster and, in turn, reducing solvent consumption. The higher pressure allows for the use of a smaller particle size for the column packing material. Columns with smaller particles generate sharper peaks with increased resolution, due to reduced diffusion distances for analytes. 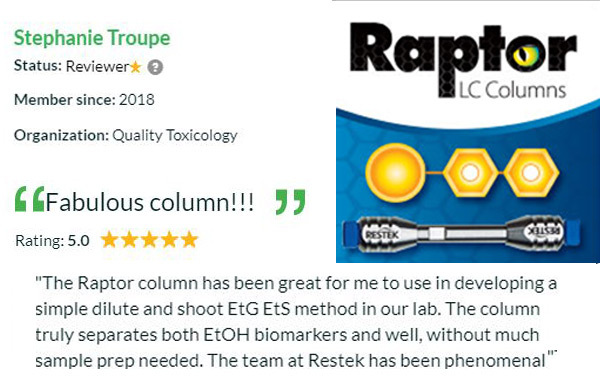 When choosing your HPLC column, consider seeking advice from chromatography experts such as Restek, who have helped analysts around the world with the innovative tools they need. By comparison, ultra-high-performance liquid chromatography (UHPLC) uses an even smaller particle size than HPLC for the packing material. This helps to produce increased resolution and sensitivity. UHPLC requires even higher pressures than HPLC, which means systems capable of handling this increased pressure can be relatively expensive. It is worth noting that methods developed for HPLC do not readily transfer to UHPLC and vice versa. However, it can be noted that some systems have been developed to bridge the gap between the two, as shown in this video interview on ACQUITY Arc System from Waters Corporation (Figure 1a). In selecting the most appropriate column, a number of considerations must be taken into account. These are summarized in Table 1, and the sections to follow. For insights into how one laboratory has adapted its HPLC analysis to advance metabolomics, watch this exclusive interview with Dr. Adam Rosebrock on The Scientists’ Channel (Figure 1b). Don't stick with the system default, be prepared to search and ask questions- it is entirely possible that the best HPLC column for your experiment won't yet have been used for your application. Look for a phase chemistry that is similar to your analyte. For example, aromatic compounds with multiple rings work well on a biphenyl phase, whereas hydrophobic compounds with alkyl chains are better suited for a C8 or C18 phase. Always use the largest particle size you can whilst still achieving resolution and sensitivity. This will be less prone to column blocking and high back pressure. Consider the type of detector and sample amount when selecting a column ID. With UV detectors and “large” sample injection volumes (5-10µL or higher,) a 4.6mm ID column is common. For “small” samples ( < 5µL) and MS/MS detection, a 2.1mm ID column is preferred. Experiment with orthogonal selectivities and not just different brands of the same phase. Screen HILIC phases similar to how you would reversed phases. Not all HILIC columns were created equally. In order to select the correct column, you will have to consider your application — there are a few simple steps to work through, to match your application to a column. The first of these is to calculate the molecular weight of your analyte. In general, compounds are divided into two groups: low molecular weight, <5000 daltons, and high molecular weight, >5000 daltons. Assigning an analyte to one of these should be relatively easy. Secondly, you’ll need to find out if the analyte is soluble in water (polar) or an organic (non-polar) solvent. Lastly, the mode of separation can be determined, to further narrow your column choice. The process is summarized in Table 2 and works as follows: if your analyte is <5000 g/mol then you should start at the low molecular weight section; if it is water soluble, move on and select your required separation mode. Further details on this are given later in this guide. HPLC and UHPLC are both routinely used within analytical research, from pure chromatographic studies to life science research and drug discovery. When the technique is used in drug discovery, for example, it has been shown to significantly improve the success of the process. It can prevent poor drug candidates from progressing through the discovery process by monitoring factors such as metabolic stability and toxic metabolite production. The technique has also been successfully applied to the separation and analysis of challenging samples such as the analysis of petroleum and the environmental impact of oil spills, as seen in this video interview (Figure 2) with Professor Sunghwan Kim, of Kyungpook National University, South Korea. The usefulness of HPLC and UHPLC can be further enhanced by linking to other systems such as mass spectrometers. There are many different columns on the market that have been designed for specific applications, such as: chirality; enantiomers; vitamins; pesticides; carbohydrates. It is worth investigating if there are already columns available that have been optimized for your application. HPLC can even be used in sample preparation, during steroid analysis for drug control in Olympic athletes. Once the application has been identified, choosing the best column for your application is based on two considerations, stationary phase and column dimensions. The first and most important of these is the type of stationary phase. The factors to be considered in this regard are the column chemistry, the separation mode, the particle size and the retention capacity. Columns are usually filled with porous particles coated with a material that interacts with the injected sample. HPLC uses what is called a true stationary phase: column ‘chemistries’ are bonded tightly to the packing material and do not bleed off. There are various ways to categorize the types of stationary phase available, but the most widely accepted of these is the USP ‘L’ system, a list of more than 60 column classifications ordered according to the type of bonded phase (C18, C8…), packing material and particle size. Table 3 shows some of the most common types. The next considerations are size, shape and chirality of the particles that make up the column packing material. The majority of new HPLC methods are performed on spherical shaped or spheroidal (almost spherical) particles. Spherical particles provide higher efficiency, better column stability and lower back-pressures compared to irregularly shaped particles. Phenyl columns (USP L11) are an alternative to C18 columns and provide a unique selectivity for aromatic compounds through pi-pi interactions. Biphenyl columns, such as the Raptor™ Biphenyl LC columns by Restek (Figure 3), are the next generation of phenyl columns. They offer both aromatic selectivity and an increase in hydrophobic retention. These phenyl phases are of particular interest when analyzing drug compounds and metabolites, such as fentanyl and its analogues. If all other factors are constant, the smaller the particles are, the more efficient the separation. The major problem with a decrease in particle size, from 10-, 7-, 5-, and 3-micron diameters, is that the backpressure increases exponentially. This roughly means a column using 3-micron particles is about twice as efficient as a 5-micron column, but pressures are three times as high. Although separation efficiencies can be increased by reducing particle size even more, to below 2 microns, the hardware required becomes more expensive, as it needs to handle the extremely high pressures. UHPLC systems have been designed to overcome these limitations and UHPLC columns can deliver shorter run times, cleaner separations, sharper/taller peaks, and improved detection limits. Some applications also benefit from end-capped HPLC columns. A reversed-phase HPLC column that is end-capped has gone through a secondary bonding step to cover unreacted silanols on the silica surface. End-capped packing materials can eliminate unpredictable secondary interactions. Top Tip: Many leading manufacturers have LC experts on hand to offer assistance when it comes to selecting the right column for you regarding problematic separations (e.g. ColumnMatch.com or Hamilton application index). By informing the manufacturer what type of separation you require, whether chiral, achiral or aromatic, they can suggest the best column for you, or even design one that fits your needs. This will ensure fast and efficient analysis of your compounds. The retention capacity is the time samples spend in the column. It is of importance to both the quality and speed of separations. The retention capacity is influenced by surface area and carbon load (the percentage of carbon in the packing material). The pore size and volume of the packing material is also important in determining retention capacity. This is because surface area is inversely proportional to pore size. A larger pore size results in lower retention. The particle pore size is measured in angstroms and generally ranges between 100-1000 angstroms; 300 angstroms is the most popular pore size for proteins and peptides and 100 angstroms is the most common for small molecules. Depending on your requirements, HPLC columns can be quite expensive and you will therefore want to ensure they last as long as possible. Guard columns can be used to protect your analytical column and prolong its lifetime. HPLC guard columns (or cartridges) are installed in front of an analytical column and protect it from strongly retained impurities. 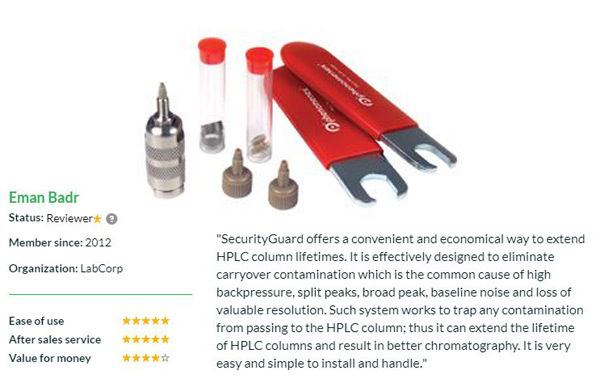 The SecurityGuard™ Universal HPLC Guard Cartridge System by Phenomenex Inc offers a convenient and economical way to extend HPLC column lifetimes. This column guard is also universal so can effectively protect all analytical columns without effecting results. An alternative to using a guard system is the use of an in-line filter. Filters are a simple, cost-effective means of providing a quick, efficient clean-up for occasional 'dirty' samples. Figure 4: SecurityGuard Universal HPLC Guard Cartridge System by Restek Corp. The physical dimensions of the HPLC column hardware should also be optimized for the desired separation. Larger columns are useful in the scale-up process, but smaller columns generally offer greater sensitivity and are therefore more useful in analytical applications. The column length is determined by how many – and what type – of compounds you have to separate. Long columns provide better resolution and sensitivity but require longer retention times and higher pressure. It is best to choose the shortest column possible for your application, without affecting resolution. The internal diameter (ID) of an HPLC column influences both detection sensitivity and separation selectivity (resolution). The most commonly used ID for HPLC columns is 4.6mm. Small column diameters provide higher sensitivity than larger column diameters for the same injected mass, because the concentration of the analyte in the mobile phase is greater. Smaller diameter columns also use less mobile phase per analysis, because a slower flow rate is required to achieve the same linear velocity through the column. The major disadvantage associated with smaller diameter columns is that the sample loading capacity is reduced. Larger ID columns (over 10 mm) are mainly used to purify large-scale amounts of material because of their relatively large loading capacity. Analytical scale columns (4.6 mm) are the most common type. They are most often used in quantitative analysis. Narrow-bore columns (1–2 mm) are used for applications where more sensitivity is required. Capillary columns (under 0.3 mm) are used almost exclusively with alternative types of detection, such as mass spectrometry. Choosing the physical dimensions of your column will therefore depend on your application and throughput requirements. The number of uses for HPLC is constantly growing and, like any other analytical tool, the realms of application are vast. Current hot topics can be seen on SelectScience in the HPLC/UHPLC section of the website. Key topics to keep an eye on over the coming months are indicated below, with some excellent examples of their applications. Industry professionals highlight glycan mapping and biotherapeutic applications as two of the most hotly discussed applications currently. Read this article to find out how UHPLC has been used accelerate glycobiology. Other examples include the use of HPLC for the characterization of biosimilars and analysis of mAbs, ADCS and impurities. Chromatography is also finding itself at the heart of cannabis analysis laboratories. In this webinar, produced in partnership with Restek, discover how both HPLC and gas chromatography are being used to ensure product quality and consumer safety. Lastly, we are also seeing increasing interest in the use of HPLC columns for the analysis of persistent environmental pollutants, such as PFOA and PFOS. Find out how scientists in California have developed systems for efficient sediment analysis using Kinetex Core-Shell HPLC/UHPLC Columns from Phenomenex in this article. Over the next few years, we can expect more advancements to emerge rapidly in the HPLC column market. Most notably, we expect to see increasing variation in column chemistries and pore sizes; as well as more columns which are designed to be short and narrow, to fit mass spectrometry requirements. We can also expect to see increasingly small particle sizes and better packed columns, aimed at increasing sensitivity and efficiency of detection. Ask the Experts: What future trends do you expect to see around HPLC columns? There are many different types of HPLC column on the market and finding the correct one for your application may seem daunting, but by applying a few simple considerations, selecting the correct column can be made an easier task . HPLC columns will continue to develop and new technologies will emerge. Visit the SelectScience product library to find out about the latest HPLC columns from leading manufacturers and read user reviews. Use the SelectScience application note library to keep up-to-date with the latest HPLC methods. Helen Whitby – Phenomenex Inc.